Author at Promontory Summit in 2008. The 4-4-0 locomotive was a thing of beauty that is hard to appreciate from photography of the mid-nineteenth century. Color photography did not exist during the heyday of the locomotive that “built” the first transcontinental railroad. 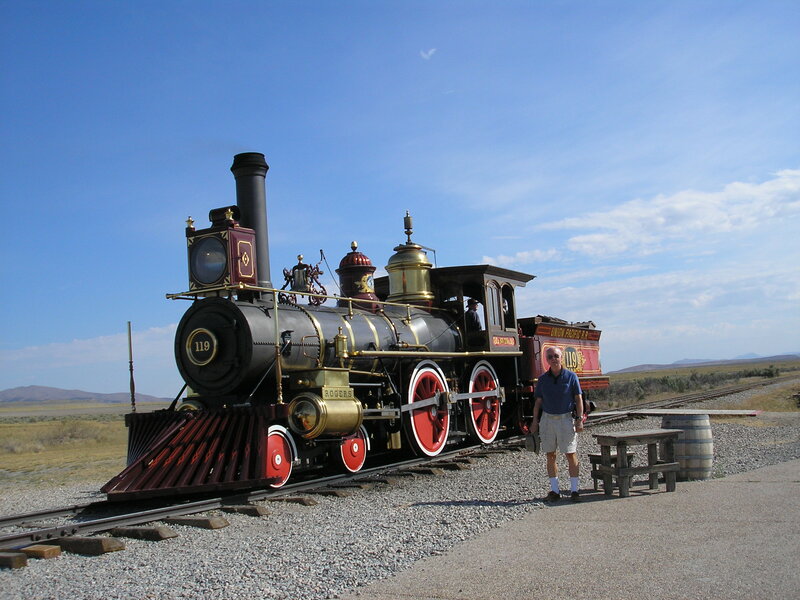 One of the most famous locomotives in the world, the Union Pacific’s #119, has been recreated by the National Park Service and is on display at the Golden Spike National Historic Site in Promontory, Utah. This faithful reproduction lets the railroad buff get up close to examine the detail. The ubiquitous black steam engine would replace these fine works of art late in the nineteenth century, but between 1836 and the mid-1880s the artistically designed 4-4-0 dominated the locomotive power used by the railroads in the United States. In fact, the 4-4-0 is nicknamed the “American.” When Will Braddock headed west in 1867 to begin his quest to determine his own destiny in Eagle Talons, the Union Pacific Railroad had 58 locomotives in operation. All but one were 4-4-0s. 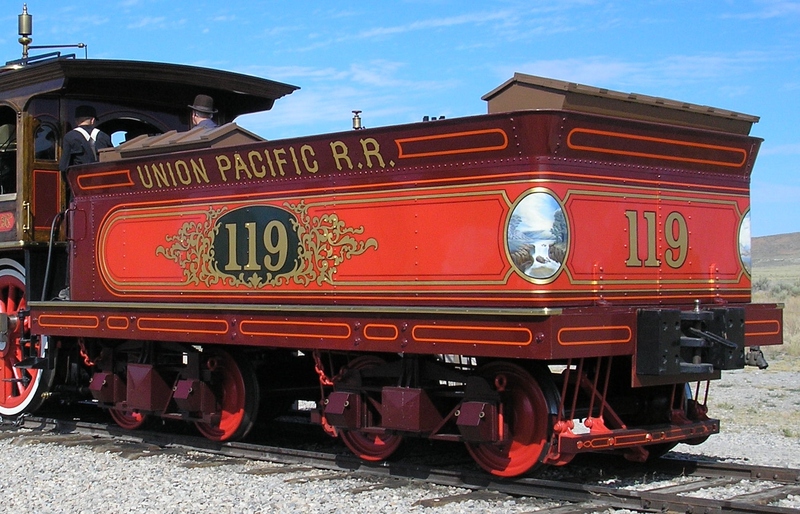 The UP’s #119 was acquired in late-1868. Will Braddock becomes familiar with this engine in Golden Spike, the third book in The Iron Horse Chronicles’ trilogy. In this photo note the painting of a waterfall which appears on the rear corners of the tender attached to Union Pacific #119. The paint work on the engine and its tender required careful workmanship to apply the striping, the curlicues and embellishments, and the fancy lettering. The brass and silver fittings are shined to a high polish. The wheels sparkle with red paint. On the side of the sand dome (the maroon colored dome atop the center of the boiler, adjacent to the bell), a detailed painting of a frontiersman decorates each side. 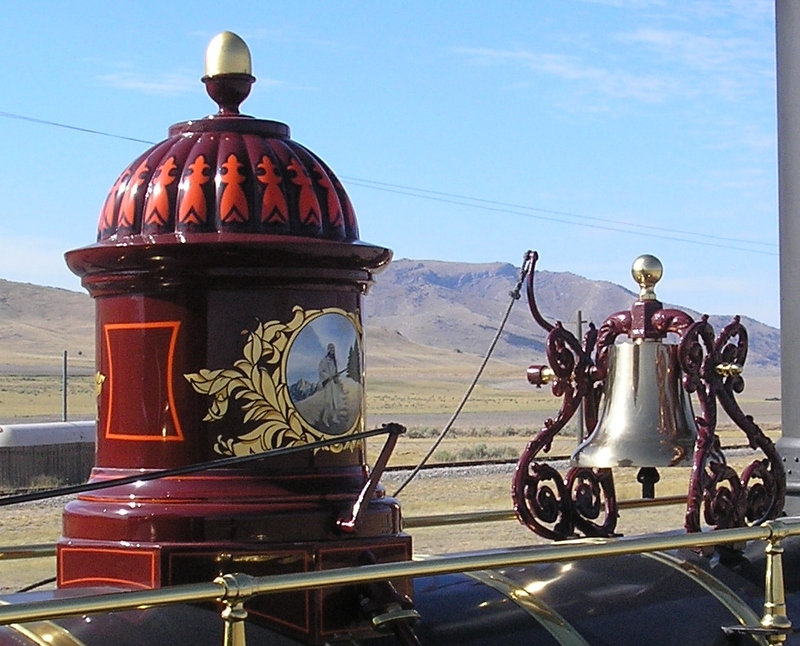 The bell would function equally as well if it were attached with simple angle iron, but that is not the way locomotives were assembled in the factories in the 1860s. 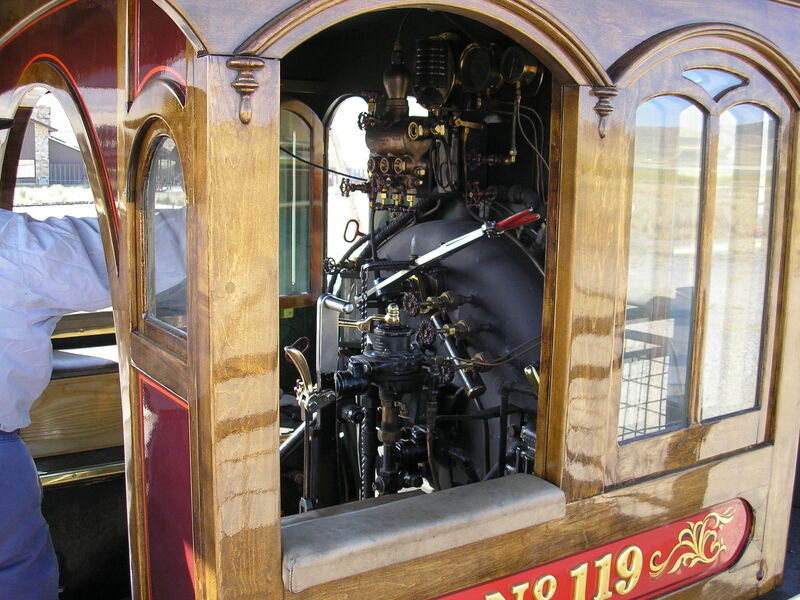 The detailed work visible around the engineer’s window of the cab displays carvings and special finishes. Slabs of black metal will replace this cabinetmaker’s artistic workmanship in later years. Click on any of these photos to enlarge them for a more detailed look. Better yet, visit a railroad museum near you where you can see similar examples of the beauty of the 4-4-0. This entry was posted in Eagle Talons - Book One, Golden Spike - Book Three, Iron Horse Chronicles' Characters, Museums and Parks, The Iron Horse Chronicles, Transcontinental Railroad, Union Pacific and tagged Adventure Fiction, Eagle Talons, Fictional Character, First Transcontinental Railroad, Frontier Fiction, Golden Spike, Historical Fiction, Historical Parks, Locomotives, Middle Grade Fiction, Museums, National Park Service, Teen Fiction, The Iron Horse Chronicles, Trains, Transcontinental Railroad Locomotives, Western Fiction, Westward Expansion (1867-1869), Will Braddock, Young Readers. Bookmark the permalink. Amazing to see the beautiful detail work on all the parts of the trains. Quite interesting. I must go to Durango, CO and see their museum again, since it’s close by. Thanks for that reminder. Can’t wait for “Bear Claws”.the 2nd book in the trilogy. Very nice picture of the author by #119.